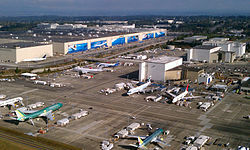 The Boeing Everett Factory, in Everett, Washington, is an airplane assembly building owned by Boeing. Located on the north-east corner of Paine Field, it is the largest building in the world by volume at 13,385,378 m3 (472,370,319 cu ft) and covers 399,480 m2 (98.7 acres; 39.948 hectares; 0.399 square kilometres). This is the factory where the wide-body Boeing 747, 767, 777, and 787 are assembled. Plans for the factory were first announced in 1966 for it to be the site of the construction of the 747 after Boeing was awarded a US$525 million contract from Pan American World Airways to build 25 747s. It purchased 780 acres north of the then little-used Paine Field, which was operated by the US Army in World War II. Boeing has had an Everett presence since 1943. In 1968 it began offering factory tours with the first roll out of the 747. Over 150,000 people visit the Everett Site each year. The factory includes a Boeing Employees' Credit Union branch and several cafés. Across the airport to the west is The Boeing Store, a theater, and a Future of Flight Aviation Center, which runs the factory tour. The Boeing Everett campus is big enough to encompass Disneyland with 12 acres left over for parking. The Everett Factory employs over 30,000 people, including its own fire department, security team, daycare center, coffee shop, and fitness center. Boeing's Everett facility. The main production building is seen in the background to the left. The Boeing 747 is a large-size, long-range wide-body four-engine jet airliner. The 747-8I, the current passenger variant in production, is capable of carrying 467 passengers in a typical 3-class configuration, has a range of 8,000 nmi (9,200 mi; 15,000 km) and a cruising speed Mach 0.855 (570 mph, 918 km/h, 495 kn). The Boeing 747 was one of the first wide-body aircraft to be produced and was the first jet to use a wide-body configuration for carrying passengers. Because of the vast size of the 747, the Boeing Everett Factory was designed and built to accommodate the assembly of these large planes as there was not enough room at the Boeing facilities in Seattle. Production of this aircraft began in 1967 and continues to this day. The Boeing 767 is a mid- to large-size, long-range wide-body twin-engine jet airliner. The 767-300ER, the current passenger variant in production, is capable of carrying 218 passengers in a typical 3-class configuration, has a range of 5,990 nmi (6,890 mi; 11,090 km) and a cruising speed Mach 0.80 (530 mph, 851 km/h, 470 kn). Production of this plane began in 1979. 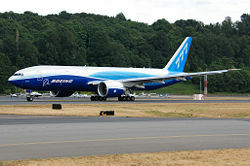 The Boeing 777 is a large-size, long-range wide-body twin-engine jet airliner. The 777-300ER, the current passenger variant in production, is capable of carrying 386 passengers in a typical 3-class configuration, has a range of 7,830 nmi (9,010 mi; 14,500 km) and a cruising speed Mach 0.84 (554 mph, 892 km/h, 482 kn). Production of this plane began in 1993. Jetstar's first 787 being built. The Boeing 787 Dreamliner is a mid-size, long-range wide-body twin-engine jet airliner. The current passenger variants in production, are capable of carrying 242–290 passengers in a typical 2-class configuration, have a range of 7,355 nmi (8,464 mi; 13,621 km)–7,635 nmi (8,786 mi; 14,140 km) and a cruising speed of Mach 0.85 (562 mph, 902 km/h, 487 kn). Production of this plane began in 2006. In February 2011, Boeing announced that some 787 work was being moved to a plant in North Charleston, South Carolina in order to relieve overcrowding of 787s at Everett caused by large volumes of 787 orders. In July 2014, Boeing announced that the 787-10 variant, the longest variant of the 787, would be produced exclusively in South Carolina as the fuselage pieces for that variant are too large for the Dreamlifter to fit for transport to Everett. Aircraft are delivered as a whole from the Paine Field Snohomish County Airport, adjacent to and south of the plant. ^ a b c "Boeing in Everett, Wash". Boeing. Retrieved 2 August 2016. ^ "Boeing Begins Assembling 3rd KC-46A Tanker Aircraft". Boeing. Retrieved 14 August 2014. ^ "Boeing looks to ease overcrowding at Paine Field". Retrieved 2011-02-27. ^ "Boeing: Boeing in South Carolina". www.boeing.com. Retrieved 2019-02-23. ^ Yeo, Ghim-Lay (2014-07-30). "Boeing to assemble 787-10 in South Carolina". Flightglobal.com. Retrieved 2019-02-23. 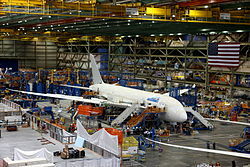 Wikimedia Commons has media related to Boeing Everett Factory.